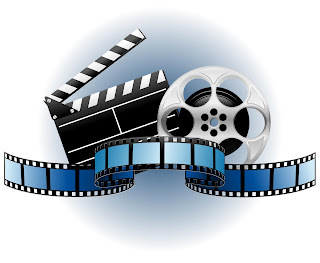 Let's watch video clips the closing ceremony of the 25th SEA Games in Vientiane, Laos 18th December 2009. 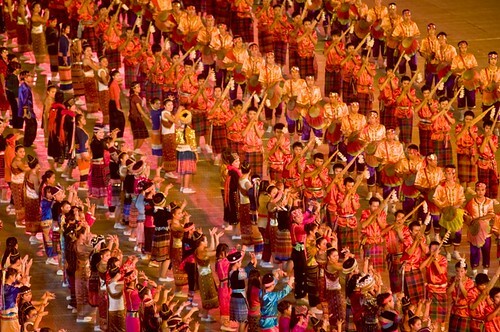 See you all again in the 26th SEA Games in the Republic of Indonesia 2011. The 25th edition of the SouthEast Asian Games came to a spectacular end tonight where in true ASEAN spirit, songs from all participating countries marked the beginning of the closing ceremony at the Main Stadium. And as government leaders and VIP Guests slowly trickled into the gathering pace of songs, the marching in of the SEA Games flag began making their way into the stadium to the pace of the Laos Police Band. Athletes and officials in their different multi-coloured costumes but all in celebratory mood were then paraded in just prior to the giving of the official closing ceremony speech by the Laos Deputy Prime Minister, His Excellency Somsavat Lengsavad. The flags of hosts Laos and also that of the SEA Games were lowered before the SEA Games flag was handed to the delegates from Indonesia to make their taking over of the next hosting job in 2011. That marked the start of the official cultural and artistic performance beginning with the 'Paddy Thrash Dance'. Then came an ensemble of Laotian favourites of the 'Lao New Year' dance, the 'Rocket Festival' dance, the 'Boat Racing Festival' dance and which culminates in the 'Gather Together Again' dance - a performance from the delegation from Indonesia. A spectacular display of fireworks to light the night sky then marked the end of the official closing ceremony and also a fabulous chapter to the 25th edition of the SEA Games when Laos played hosts to an incident-free meet. The 25th SEA Games here in Laos will go down in history as the Games with many firsts. While Laos hosted the Games for the first time, this landlocked Indo-China nation has certainly left a big mark in the world of sports in this part of the world. A poor nation in terms of economy, Laos left no stones unturned in their bid to leave a lasting impression among the 11 participating countries that it has arrived to take on the best in the region - both in terms of sporting excellence and development. From the friendly people with an ever ready smile and greeting you with a warm sabaidee (Hello), the Laotians extended their hospitality to one and all who came to the country for the Games - as participants or as visitors. More importantly, Laos shed its 'whipping boys' or 'minnows' tag and put up an impressive performance in the sporting arena with an impressive haul of medals won by their athletes. From winning just five gold medals at the last SEA Games in Korat, Thailand in 2007, Laos made every one sit up and take note of their athletes as they raked in 33 gold, 25 silver and 52 bronze medals - surpassing their earlier target of 25 gold medals. As expected, Thailand topped the medal tally with a haul of 86-83-97 but the entire kingdom was left weeping by losing the football gold - dubbed the 'mother of all gold medals' in both the men's and women's football. Thailand had been winning the SEA Games crown in men's football for the last eight editions since 1993 while for the women, they were the defending champions. Thai football has certainly taken a beating in Laos where it is the first time since 1973 that Thailand failed to make the final four in football. At the same time, Laos are fast gaining on the football powerhouses in the region by reaching the semi-finals before falling 3-1 to eventual champions Malaysia. On the other hand, Malaysian regained their status as the SEA Games football champions with a 1-0 win over Vietnam in the final. Malaysia also knocked out Thailand from a place in semi-finals. And Thailand's supremacy as the top sports nation in the South East Asian region have also come under serious threat. Vietnam finished a close second in medal tally with figures of 83-75-57. Indonesia established themselves as the sprint kings with Suryo Agung Wibowo retaining his 100m with a new record of 10.17 (which is faster than winner 's time of 10.21 at the 2006 Doha Asia Games) and the 200m. Indonesia, who will host the 26th edition of the Games in 2011, also hailed little "wonder girl" Triyaningsih, who stands at 146cm and weighs slightly over 37kg, as the long distance queen. She retained the 5,000m and 10,000m golds with the latter in a record time of 32:49.47 (old record 33:50.06). The 21-year-old from Salak Tiga in Central Java, is ranked eighth in the world in women's marathon. The men's 10,000m also went Indonesia's way with Agus Prayogo taking the gold. He also took the 5,000m gold for repeat his success he achieved in Korat. Malaysia's ended a 12-year wait in the men's 400m with Mohd Zafril Zulaisni taking the gold - after Romzi Bakar last won the gold in Jakarta in 1997. Vietnam broke the monopoly of traditional powerhouses Malaysia and Indonesia in pencak silat by taking six golds compared to the three gold haul in Korat. Laos shooters and taekwando exponents were also on golden trail - sending out strong signals that their rivals will have to take note of their 'arrival' in the two sports. A big 'thank you' to the people of Laos. You made us all feel at home while showing true sportsmanship in the battle for the medals in what is a incident-free SEA Games when it comes to the subjective sports. Laos may have finished in mid-table in the medal standings but you were the big winners overall. We are bound to hear of Laos in the coming future. A point to note is that every nation returned home with a medal to show for their participation where Timor Leste at least won three bronze medals - a significant showing of the Games anthem of Generosity, Amity, Healthy Lifestyle. Lao wushu fighters smashed their medal target yesterday, winning three more gold medals to add to their tally in the sanshou finals on the last day of wushu events at Lao-ITECC. 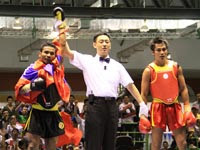 The first gold came from Khamla Soukaphone, who beat Phan Vah Hau of Vietnam in the 52kg category. Phoxay Aphailath won the day?s second gold for Laos in the 56kg category, defeating the Philippines? Benjie Rivera, while a third came from Bouapha Valasith, who beat Junaidi Sukamto Rahmat from Indonesia in the 60kg category. The President of the Lao Wushu Federation Mr Oudomsak Oudomthongkasem expressed his satisfaction that the Lao fighters had morethan doubled the federation?s medal target at the SEA Games, winning five gold, two silver and 4 bronze medals. ?Wushu is still a new sport in Laos, after this achievement our federation will expand in Vientiane and other provinces to draw on more resources and train good fighters to compete in the next SEA Games and do even better than in this event,? he said. The Lao Wushu Federation entered 10 men and nine women in the 25th SEA Games wushu events, competing in men?s and women?s changquans (long fist, broad sword play and cud get), nanquans (southern fist and southern cudgel play), taijiquans (taijiquan and taijijian), duilian (barehand and weapon) and sanshou in weight categories of 45 to 65kg. Their current successes build on those of previous SEA Games competitions, where in recent years Lao fighters have come away from the events with gold, silver and bronze medals. Hundreds of fans packed the Budo Centre yesterday to cheer on 22-year-old Lao fighter Ms Phonenaly Sayarath who rewarded them with Laos ' first gold medal in judo. As her supporters' shouts rose to a crescendo, Ms Phonenaly defeated her Thai opponent Sureerat Sadmaroeng in the final round of the women's under 52kg weight division. Three Lao fighters competed in yesterday's final rounds at the Budo Centre. The fans' enthusiasm was rewarded by Ms Phonenaly's gold medal and the efforts of two other Lao fighters, Ms Syamphone Phetnida in the women's under 48kg and Ms Chitchinda Bounphaaksone in the under 75kg, who both won silver medals. Ms Syamphone and Ms Chitchinda were outmanoeuvred in their final rounds by their Vietnamese rivals Van Ngoc Tu and Nguyen Thi Kieu. 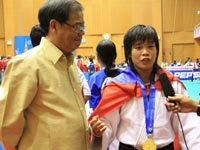 Ms Phonenaly's gold medal was her first and also the first for the Lao Judo Federation at this SEA Games c ompetition. “I am really happy to have won gold at the SEA Games, especially since the event is taking place in my motherland. Thanks to all of my fans for cheering for me,” she said. Ms Phonenaly has competed in the SEA Games on three occasions. The first was at the 23rd SEA Games in 2005 in the Philippines , and her second medal attempt was at the last SEA Games in Thailand in 2007. “I finally have the top prize after winning bronze at the last SEA Games and getting nothing in the Philippines ,” she said. She believes her success at this year's games is the result of two years of hard training in Japan , where she is studying. Judo fighters competed for seven gold medals yesterday. Vietnam won three gold medals, while Myanmar , the Philippines and Thailand received one each. Today, seven more gold medals are up for grabs in judo. Laos has high hopes for two in the men's over 100kg and under 90kg categories, according to Lao judo trainer Chittiveth Nouankhaising. The Media Communication Committee made a significant achievement in contributing to the success of the 25th SEA Games, Deputy Minister of Information and Culture Prof. Dr Bosengkham Vongdara said yesterday at a press conference at the Media Centre. Dr Bosengkham, who is also Media Communication Committee Chairman for the 25th SEA Games, said “Information from reporters and the media contributed greatly to the success of the SEA Games. We made an admirable and significant contribution to the promotion of the event. Lao people living in the provinces and overseas and all those interested in the games received timely information. We saw people living in Vientiane respond and actively take part by attending events and showing their enthusiasm.” Dr Bosengkham said reporters and media organisations had benefited and raised their skill level through their coverage of the games. Reporters now knew how to better cover, send news and coordinate among themselves and other countries. The government has invested a large amount of money in the media to improve infrastructure, training and equipment. “Feedback from the public suggests they think the media have done a good job, with presenters and reporters in the field giving good information,” Dr Bosengkham said. The Media Communication Committee consists of five sub-committees, which all started preparing for the SEA Games in August 2008. They have promoted the event from December 2008 right up to the opening day of the SEA Games on December 9. The committee and media organisations across the country created several special programmes for radio and television and published newspaper articles to deliver information to the public in a timely manner. “All media organisations performed well in the important tasks the government assigned them,” Dr Bosengkham said. More than 700 local journalists participated in covering various areas of news relating to the SEA Games. “Reporters have been actively reporting news since before the start of the games until the opening ceremony,” Dr Bosengkham said. Apart from this, 1,600 foreign journalists from Asean countries took part in the SEA Games, writing many articles about the event. People in Asean countries received information about the opening ceremony and every sporting event from journalists doing an important job in Laos . The foreign news agencies took SEA Games news and produced TV programmes. They also booked a live broadcasting room. This allowed people living in Europe and the United States to watch the games. Dr Bosengkham said Lao Channel 1, 3 and Lao Star broadcast their programmes to the world and in the Lao provinces. Local people and Lao people living overseas all enjoyed watching the games on these channels. Despite gaining seven more gold medals yesterday, Laos remains at seventh place in the medal standings while Vietnam and Thailand are in a head to head battle for top honours. The battle for medals will end this morning, with the afternoon set aside for preparations for the 25th SEA Games closing ceremony at the National Stadium. The ceremony will begin at 5:10pm with musical entertainment, followed by a programme of performances and displays. The first gold medals for Laos yesterday came in the morning thanks to experienced boxers in the muay Lao (kick boxing) ring with their haul of three gold medals in wushu sanshou at Lao-ITECC. Some of the tactics used in muay Lao are very similar to those employed in wushu sanshou, which gave Laos the edge and brought them resounding success on home soil. To date, the wushu team has taken five gold, two silver and four bronze medals. After the five muay Lao gold medals they earned earlier in the week, the team has become the most successful in Laos at the games. The first gold of the day for Laos was a victory by Khamla Souphaphone after he easily beat Phan Van Hau of Vietnam in the men's 52kg boxing event. 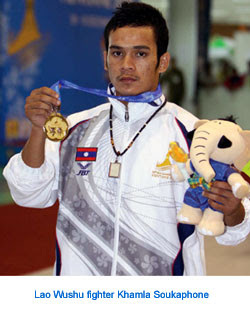 Khamla won the silver medal at the last SEA Games in 2007 in Thailand . Khamla was the best boxer in the muay Lao ring with 70 fights to his credit. Muay Lao fans know him as Anantaxay Sor-souphaphone. “This gold medal is a good token for me to welcome in the New Year of 2010 and also a wonderful reward after a long year of hard training,” Khamla said. More gold medals in wushu followed from 2006 Asian Games silver medallist Phoxay Aphailath in the men's 56kg and Bouapha Valasith in the men's 60kg category. Other gold medals taken by Lao athletes yesterday included one in the men's under 120kg judo event for Khemkham Kommanivong, one in the boxing ring for Vilasak Khouandy in the men's 64kg light welterweight, one in men's surface fin swimming 200m for Bounthanom Vongphachanh, and another in the men's pencak silat class I under 90kg for Pheumthavy Vongphackdy. Yesterday was a day of victory for Lao athletes at the ongoing SEA Games on home soil when they reached their target of 25 gold medals, as some optimists had predicted ahead of the games. The eighth day of competition will go down in the record books as being the day when the magic number of 25 gold medals for Laos was reached in 25 sports at the 25th SEA Games. The first gold medal yesterday came at 5:31pm, after a long day of waiting, thanks to Phonenaly Sayarath who won the women's under 52kg division in judo. Other gold medals that pushed Laos towards success came from the swimming pool at 6pm, when Chrichina Sindara won the women's 50m surface fin swimming event and Amdavanh Phanmibounkong won the women's 400m surface fin swimming event. Despite having reached their gold medal target, Lao athletes will continue to pursue their quest for even more gold in the last two days of competition. The petanque team, who were favourites to win a gold medal yesterday, managed only bronze. Of the 11 gold medals up for grabs in petanque Laos is hoping to claim at least four. So far, they have picked up one gold, one silver and five bronze medals in the sport. The gold medal was won in the women's doubles on Monday by Manivanh Souliya and Noitavane Pasert. The final two gold medals in petanque will be there for the taking on Friday in the men's and women's triples events. Yesterday afternoon Laos claimed a silver medal when 20-year-old Milvady Hongfa took second place in the women's light flyweight 48kg boxing event. On the shuttlecock court where Laos hoped to win one gold medal from the two events being contested, the team scooped two silver medals, with both golds going to the more experienced Vietnamese team. In the round robin competition in women's football, Laos came in fourth, while Myanmar took the bronze medal. The gold medal was won by Vietnam after they beat defending champion Thailand 3-0 in a penalty shootout at Chao Anouvong Stadium yesterday. The last men's football matches will take place today. The bronze medal match between Laos and Singapore kicks off at 3pm at Chao Anouvong Stadium, while the gold medal match between Vietnam and Malaysia will begin at 5pm at the National Stadium. Lao sepak takraw team manager Khamvanh Nanthavong said the main goal of his team was to be good hosts and they were not expecting any major triumphs at the SEA Games. Mr Khamvanh was speaking after his team lost to Thailand in the final of the men's regu event in Vientiane yesterday. “Our goal is to be a good host. We're not hoping for anything else so we got the silver medal today. But I was proud because our team still lacks experience. We can't compete with the Thai players because they have so much more experience,” he said. In the final match of the men's regu event, Thailand took the gold medal 2-0 with scores of 21-16 and 21-12. Mr Khamvanh said his team had only two years of experience but the Thai team had been in the sport for 10 years, so their levels were very different. At the start of the game, Laos and Thailand were level and there was almost no difference in score. But the Thai team started to pull away and Laos lagged behind to finish in second place and take the silver medal. “Before the next SEA Games in Indonesia , Lao sepak takraw players will get as much as experience as possible,” Mr Khamvanh promised. The Lao sepak takraw team is now running fourth in the sport's medal tally with one silver and two bronze medals. Thailand has five gold medals, Myanmar has one gold, one silver and one bronze medal, and in third place is Vietnam with three silver medals. In the women's regu event which took place on the same day between Thailand and Vietnam , Thailand beat Vietnam 2-1 with a score of 19-21, 21-8 and 15-9. In today's events, the Lao women's and men's doubles teams will face Malaysia , Indonesia and Thailand at the Lao International Trade and Exhibition Convention Centre starting at 9am. Spectators returning home after the SEA Games are assured there will be plenty of buses running to the north and south, when the games end on December 18. Bus operators told Vientiane Times yesterday they had enough buses to provide everyone with a journey home, whether going north or south, and there was no need to worry about getting a seat. An official in charge of bus provision at the Chitprasong Transportation Company (northern route), Mr Khamdy Phimmasone, said there would be about 100 buses available, including privately owned buses registered with the company. “I believe this number will be sufficient to transport everyone in the rush to return home after the games,” Mr Khamdy told Vientiane Times. The company has been able to provide extra buses at peak times in the past, especially at the busiest time of the year during Pi Mai Lao (Lao New Year) in the middle of April when many people travel, he said. At that time there are more than 50 buses in service - double the number that normally run on regular routes. Mr Khamdy was unable to say how many extra buses would be added to cope with SEA Games passengers, saying it depended on demand. “We will organise extra buses depending on the number of passengers. 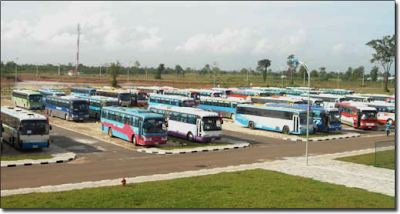 We can have buses available if need be and can organise additional buses immediately if they are required,” he said. The situation is similar going south, with the Chitprasong Transportation Company ready to get travellers home, according to Southern Terminal Transport Association President, Mr Khamsaen Thammavong. Bus companies are expecting a surge in customers after the games. As well as a boost in Lao passengers they anticipate a rise in foreign visitors travelling onwards to other parts of the country. Transport providers had their busiest time at the start of the games when supporters from the provinces flocked to Vientiane . Extra buses were laid on between the provinces and the capital and they were always full, bus operators said. Normal services are running at present with one bus departing for the southern provinces every 30 minutes from 4:30am to 8:30pm every day and one bus every one to two hours going north from 6:30am to 8pm. The situation is fairly quiet at the moment. “Fewer people are travelling these days because so many people are in Vientiane for the games. However, we expect a rush when the games are over,” Mr Khamsaen said. He said more people were booking bus tickets these days, perhaps because they were afraid there would be a shortage of buses. “No problem, we have enough buses available,” he said. The Lao muay team became the most successful in the country's history when the close of competition at the ongoing SEA Games saw a haul of five gold medals around their necks. Yesterday was the final day of the muay events at this year's SEA Games. The Lao team had four boxers in the ring competing in seven gold medal bouts. At the end of the day the Lao team took home three gold medals and one silver. The team won two other gold medals, two silver medals and one bronze medal on Monday. The three gold medals for Laos yesterday came from Phoutthasone Keosayavong in the female light flyweight 48kg, Thongbang Seuaphom in the male flyweight 51kg and Paylor Xaypao in the female featherweight 57kg division. “My future now is to continue to have more international fights with the national squad and to win more gold medals for Laos ,” the 20-year-old Thongbang said. On the same day, the shuttlecock team also had their best success by scooping two gold medals and one silver. The first gold came in the men's doubles from Southisone Thonmanivong and Khamphong Phouthong. Another gold medal was won in the mixed doubles by Ms Pathoumphone Phammachane and Mr Phongeun Kongmany, while the silver medal was won in the women's doubles by Ms Malaythong Daosisavan and Ms Khamkhoun Luanglath. 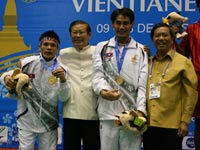 Yesterday's gold medals followed the first gold medal for the shuttlecock team on December 13 from Southisone Thonmanivong in the men's singles event. The latest medal standings updated at 7pm on Tuesday placed Laos in seventh position out of the 11 competing countries with 22 gold, 11 silver and 35 bronze medals. This was on the seventh day of competition since the official opening ceremony on December 9. The best medal tally for Laos in any previous SEA Games was 5 gold, 7 silver and 32 bronze medals. Khamla Xayavong, 21, has become the latest Lao hero after scooping three gold medals in shooting events. Yesterday Khamla struck gold in the 10m running target mixed event. She won the event with a score of 358, beating silver medallist Ha Dang Hong of Vietnam, who scored 353 points, while Khamla's team-mate Hongkham Xayalath took the bronze medal with a score of 352. Khamla also bagged a silver medal in the mixed 10m running target category, scoring a total of 1,040 points. The gold medal in this event went to Vietnam with 1,043 points, while bronze went to Thailand with 977 points. “I am very happy and proud to win three gold medals and a silver for the home fans. In the future I will try to improve my shooting skills and hope to be a national shooter forever if the nation needs me,” said an excited Khamla. Before picking up her third gold medal yesterday, Khamla scored 367.0 to set a new SEA Games record in the women's 10m running target event on Saturday. The previous highest score in this event was 358.0. She collected another gold medal on the same day in the women's 10m running target team event. Now sports fans around the country are in awe of Khamla because it is the first time in Lao sporting history that one competitor has won more than one gold medal at the SEA Games. Three gold medals is a wonderful present for Khamla as she approaches her 22nd birthday on December 30. So far, Lao shooters have amassed three gold, one silver and one bronze medal. 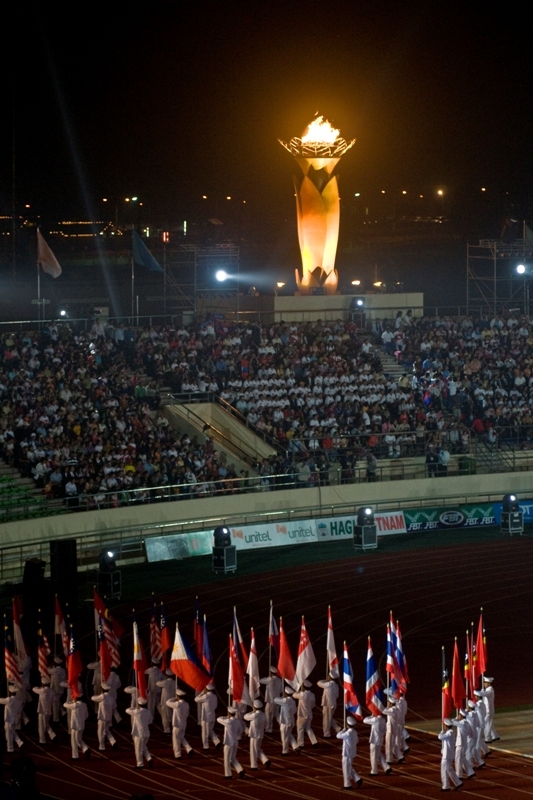 Which country will be the champion for the 25th SEA GAMES in Vientiane, Laos 2009?